One of the stated goals of the Blue Jays’ front office after a tough 2017 season was to improve the team’s depth. Injuries and ineffectiveness forced the Jays to go to their bench more than they wanted to last year and there weren’t many bright spots among the guys that subbed in for the Jays regulars. The backup catcher position was a tire fire, the infielders couldn’t hit a lick, and none of the depth call-ups distinguished themselves. It didn’t take long in this season for those twin menaces, injuries and ineffectiveness, to strike the Jays again. But in contrast, some of those new guys (and a couple old friends) have already distinguished themselves. Let’s run down some of the Jays’ breakout backups, and where they’ve already helped. 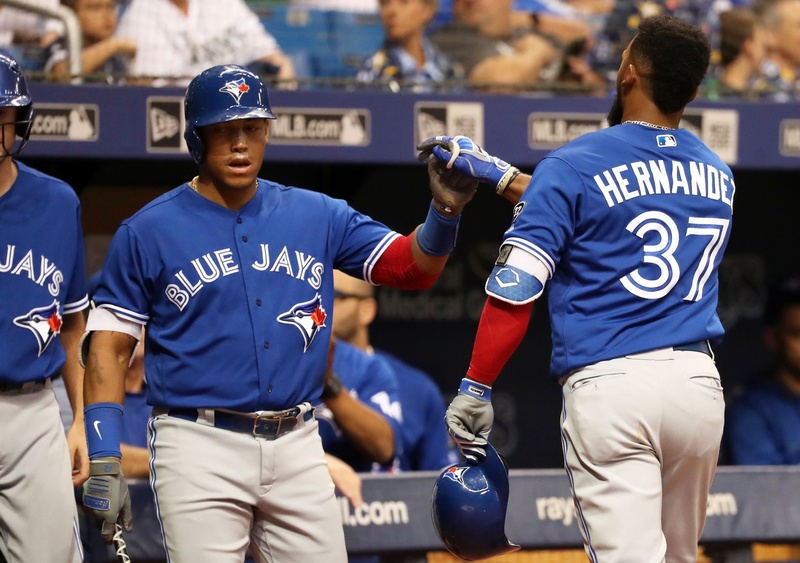 Any talk of the Jays’ strengthened second unit has to start with Yangervis Solarte. It’s hilarious now to think that the initial plan for Solarte was to be a super-utility guy coming off the bench, playing the corner infield and second base at times. The versatility came as advertised — he has played every infield position, subbing for Josh Donaldson and Devon Travis most regularly and even getting a turn at shortstop. The power was a surprise; he currently leads the team in dingers with nine. His enthusiasm was also welcome, dancing and cheering his way into fans’ hearts quickly. Though Donaldson has returned, Travis’ demotion to AAA and the revolving door at shortstop will likely leave Solarte getting regular at-bats, until more regulars return or a cold streak sends him back to the bench. Aledmys Diaz hasn’t been quite as good, but has still provided some value. He was also expected to be depth, but the spring training injury to Troy Tulowitzki meant a route to regular playing time for him as well until his recent injury. Though he hasn’t matched his heady 2016 numbers at the plate, he has been solid at shortstop (which is a nice surprise), and has provided something resembling a threat at the plate, something last year’s backups (Ryan Goins and Darwin Barney) couldn’t reasonably claim. Steve Pearce was one of the few bright spots from 2017’s bench, and has continued to be exactly what he’s always been: a good right-handed bat against left-handed pitching, someone who plays the outfield like an infielder, and someone who gets hurt every season. Being on the short-side of a platoon with Curtis Granderson had been perfect for Pearce until his injury, and that will be his likely role when he returns. That is, unless Pearce gets supplanted by Teoscar Hernandez, currently manning right field in the absence of Randal Grichuk. Hernandez impressed in September of last season, hitting some monstrous home runs (and striking out an awful lot). There’s still some small sample size caveats with Hernandez’s performance so far (let’s see how he does after the league’s seen him a few times this year), but there’s also reason to believe that this could be real. When Grichuk gets back, the Jays may have a difficult decision on their hands. Luke Maile was one of several terrible Jays’ backup catchers last year, and the idea of the Jays running it back with him seemed unappetizing, to say the least. That he’s third on the team in slugging percentage and already has more hits than he had last season is a delightful surprise, and one the Jays will certainly take with how much he’s playing, roughly once every third day for Martin. With Martin struggling at the plate and Maile flourishing, the Jays have had little reason to fear a Martin day off so far, either at or behind the plate. While the bench guys probably won’t be this good for the entire season, they won’t need to be. Travis and Grichuk are working their way back, and those two and Russell Martin probably won’t hit under the Mendoza line for the entire season. That the Jays have gotten good hitting and reliable defense from guys not expected to be regulars has been a huge reason for what success they’ve had so far. The Jays absolutely succeeded in improving their depth for this season, and John Gibbons can and should have confidence in that depth going forward.